Berry Bros. & Rudd Linkwood 20yo 1991/2011 (46.0%): A random pick from ever growing sample yard on my desk. 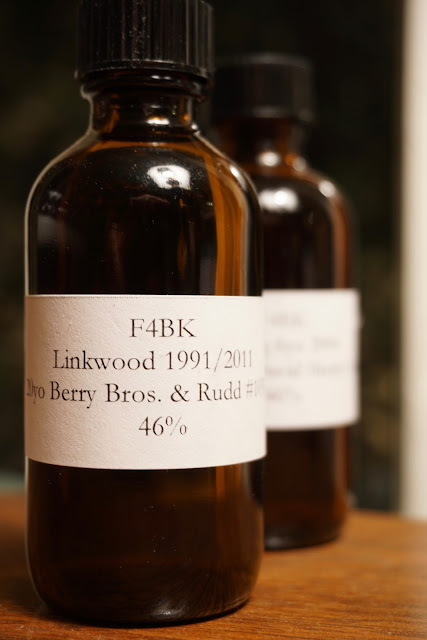 It is a 20 year old Linkwood from Berry Bros. & Rudd distilled in 1991 and bottled in 2011 from the cask carrying the inventory number #10343. Linkwood is a Speyside distillery from Diageo's roster with a sizable capacity of 5.6 million liters with no official bottling except one Special Releases from 2016 and one 12 year old Flora & Fauna release. Color: Very light for a 20 year old whisky. Riesling or unoaked Chardonnay with very impressive thick and slow legs. Palate: More grassy, less fruity on the palate. Actually reminds me the golden era of Bladnoch bottlings from Raymond Armstrong years or older Rosebanks. In other words I am loving it... Cereals, crystalized ginger and fresh cut grass. Pine nuts and oatmeal cookies. Creamy and viscous: Mexican flan, vanilla pudding and cream pies. Finish: Kinda on the shorter side but white pepper lingers long enough after ginger candies and panna cotta fades out.